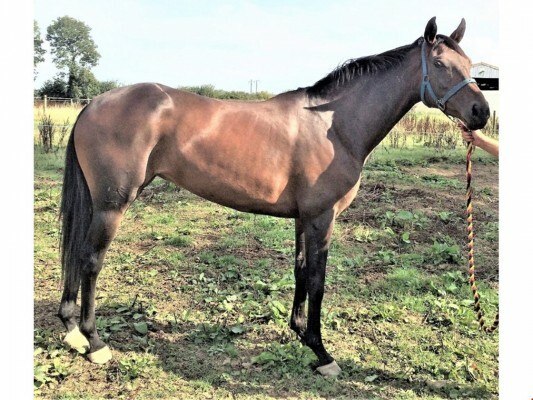 The unraced six-year-old Oscar mare Eternal Leader, who boasts a top-class Irish NH pedigree, is offered for sale as a breeding prospect. She is out of the Supreme Leader mare Eternal Lady, who was a very useful performer on the track. She was runner-up on her bumper debut, before winning at the fifth attempt at Fairyhouse by 15 lengths. Racing in the famous Magnier silks, she was then a 25 length winner on her hurdling debut - defeating the subsequent Grade-2 winning and multiple Grade-1 placed chaser Snowy Morning in the process - before gaining black-type when third in a Listed hurdle at Cork. Since having her attentions switched to breeding Eternal Lady has produced foals by Milan, Leading Light and Westerner, and of course a 2013 mare by Oscar. Oscar's legacy is assured as he is the sire of the winners of virtually all of NH racing's marquee events, such as the Gold Cup, Champion Hurdle and Champion Chase, whilst he is the broodmare sire of Grade-1 winning novice hurdler Backspin. His commercial relevance is as strong as ever, evidenced by the £400,000 paid for his son Trevelyn's Corn just over a year ago, whilst his mares have auctioned for figures up to €350,000 during a long and profitable career. He is a sure-fire boost to the page of any NH prospect. The further family on the distaff line confirms the enduring appeal of this family. Eternal Lady is one of six winners out of the Buckskin mare Designer Lady, her siblings including the 131-rated chaser The Westerner Boy. Designer Lady's full-sister Myra Gaye would go on to produce the Grade-2 Bobbyjo Chase victor Afistfullofdollars, whilst the next generation of the family features NH royalty in the shape of Champion Hurdle winner Gaye Brief and the Stayers' Hurdle winner Gaye Chance. Clearly Eternal Leader has high-end potential as a NH broodmare. This is an excellent opportunity to purchase her at the outset of her breeding career.